We do most of our work in house and only sub-contract specialist work to a small network of trusted and proven suppliers. 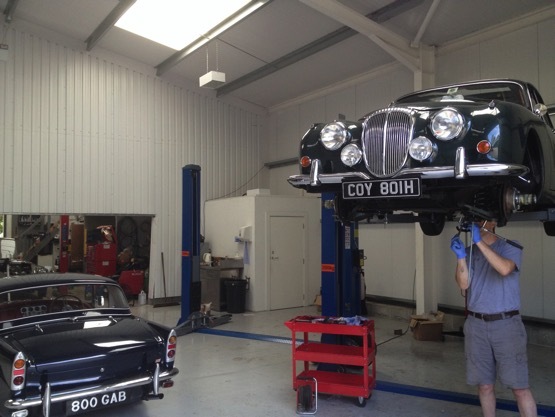 The workshop has 12 bays, 3 of which have hoists so that we can work comfortably underneath cars. Dirty and dusty work such as media blasting and paint spraying is carried out in a separate facility which allows us to have a clean area for engine building in the main workshop. 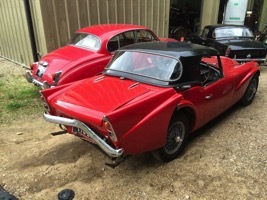 Servicing and preparation for MOT - many customers like to carry out their own basic servicing and we are happy to undertake specific tasks such as carburettor balancing, tappet adjustment, timing, wheel alignment etc. We do not MOT test cars ourselves but use a local garage who provide one of the most rigorous inspections I have ever experienced. 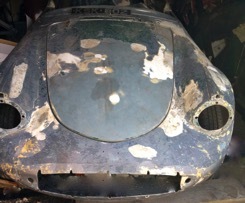 Dart Chassis repairs - although the grp bodywork does not rust, the chassis will rot severely and 90% of body-off restorations need the addition of new metal. 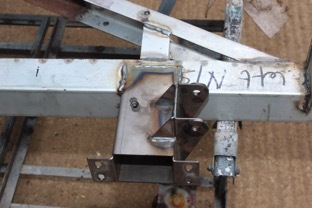 As well as carrying a large stock of chassis repair sections which we have had fabricated, we can also supply A frames and cross bars which are required to convert A spec Darts to B spec or to replace frames that have simply rotted away. 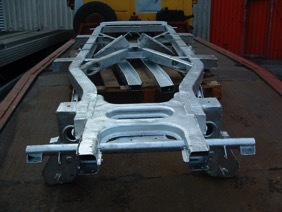 Once a chassis has been blasted and repaired we can offer 3 choices of finish - painted; galvanised or plascoated. Of these, plascoating is by far the most popular as it provides a high quality finish with good resistance to stone chipping. 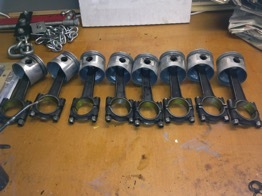 See new parts for sale for further information on chassis parts. 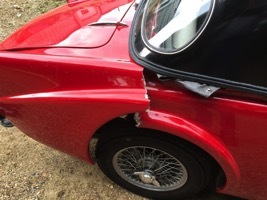 Paintwork and accident repairs - we have experience of dealing with insurance companies on accident as well as the know-how and parts support to implement repairs. On Daimler Saloons, depending on the severity of damage, we will work in collaboration with our paint shop which is located just a couple of minutes away from the main workshop. Our paint shop has low-bake facilities and uses the latest 2 pack paints for colour integrity and durability. We can spray your car any colour you choose so if you have a favourite Ferrari colour for example, we can obtain it. Remember that after Jaguar took over Daimler, they would allow customers to order their SP250 in any Jaguar colour as well as the Daimler range. So, if authenticity is important to you, you can pick from a wide range. 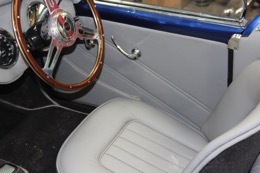 Upgrades - we are pleased to fit the various upgrades we offer either as part of a restoration or as discrete workshop jobs. Trim - we have an in-house trimmer which enables us to provide very competitive quotations for all your trim requirements. The Edward Turner V8 is a superb engine that adds massively to the pleasure of owning a Daimler. Changing the oil is a lot easier (and safer) than trying to do it at home! 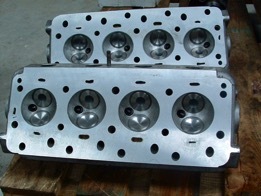 Upper left is a galvanised chassis. The right hand chassis has been plascoated. 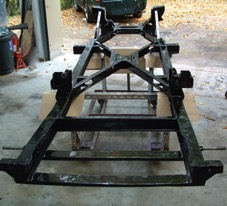 The chassis below was heavily corroded and is pictured in the final stages of reconstruction. The Dart was severely rear-ended but repaired satisfactorily. The Dart in the bottom left picture is being prepared for a full respray after reparation of previous accident repairs. 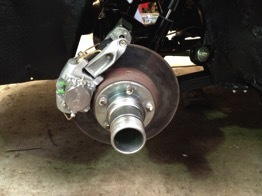 These are upgraded brakes for a Daimler saloon.